Yes, this aired as a two-part special. And on that day the thieves’ tribe was never the same again. In a fantasy world there live two tribes of thieves, who are rivals with each other. One of the thieves’ tribe is led by a man named Mattis, whose wife, Lovis, delivers a baby on a stormy night. The baby is a girl, and Lovis decides to name her Ronja. The same night that Ronja is born, a fearsome lightning strike splits Mattis’ castle in two, though luckily no one is hurt. Lovis is such a great character. Ronja, being the only baby to be born to the thief tribe, is loved and adored by the other thieves; and is practically spoiled by her father, Mattis. Mattis constantly runs home to look after her, even neglecting his thieving duties to do so (much to the annoyance of his wife). Eventually, Ronja grows into a healthy and happy child. Mattis decides that Ronja is finally old enough to venture into the forest, but not before giving her a long lecture about the dangers of the forest first. It only took two episodes to get here, but hey. And so, Ronja takes her first steps into the wilderness. Mattis is the best dad. Well, other than the thieving part. 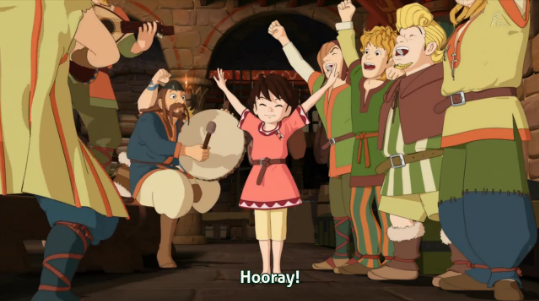 Sanzoku no Musume Ronja is actually based on a Swedish children’s book. 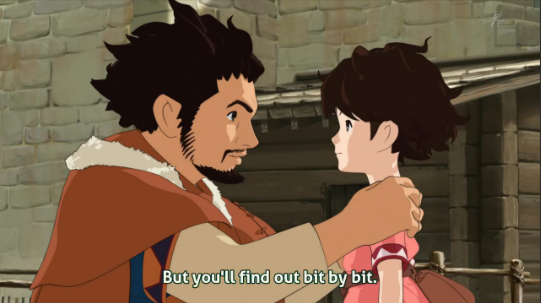 Adapting children’s books is nothing new for Ghibli, so I have no doubts that this will be a good adaptation. However, I do have to criticize the extremely slow pace of these two episodes. Sanzoku no Musume Ronja is set to be a 26 episode series—which struck me as being sort of long for a children’s book that’s only around 235 pages long. Because of this, I couldn’t help but feel that a lot of these two episodes were, well; filler. That’s not necessarily a bad thing, since it allows the characters to be fleshed out a lot more. 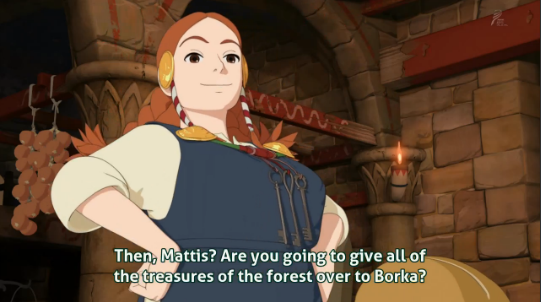 But, as cute as Mattis being smitten by his baby daughter are, I’m sort of glad we FINALLY get to see Ronja beginning her exploits towards the end of episode 2. 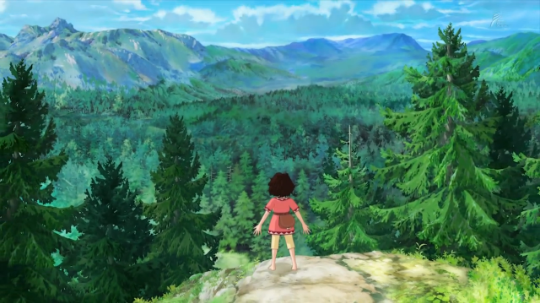 Despite this series being animated with a mix of 2D and CGI animation, it still looks very nice. Obviously there are some scenes where the animation does seem a bit unusual, or the CGI more prominent. But overall I think the style was done quite well. The characters themselves are all pretty fleshed out and believable. I really like the dynamic that Mattis and Lovis have with each other. Mattis is actually the one who overdoes the doting on his daughter, with Lovis being the more calm and logical one. 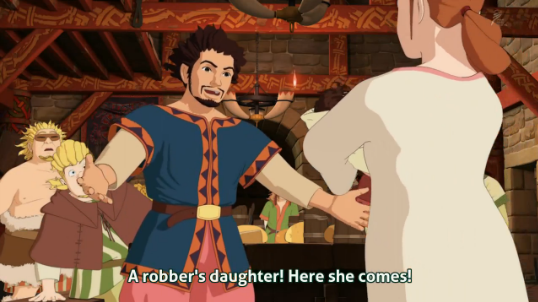 The other thieves in the tribe are all pretty distinct design-wise, which is nice considering they don’t play as major of a role as Mattis, Lovis, and Ronja. Speaking of Ronja, we don’t get to learn too much about her yet, since she was a baby and all. But she seems like the kind of strong-willed heroine that Ghibli is famous for. Overall, this seems like it has the potential to be a great series, though I do worry a bit about filler material. Like I said, the original book was only 235 pages long, so 26 episodes seems to be stretching the material a bit. Since this is being partially handled by Ghibli, though; I’m sure even the “filler” will be handled gracefully. Sadly, as charmed as I am by this series, this series just seems too slow-paced to be good for an episode-by-episode review basis. Also, since I already decided on Magic Kaito to review, I don’t want to fill up my schedule with another two-cour anime series. But if you like anything Ghibli, you should definitely check this out. The forest scenes in this series are really lovely.